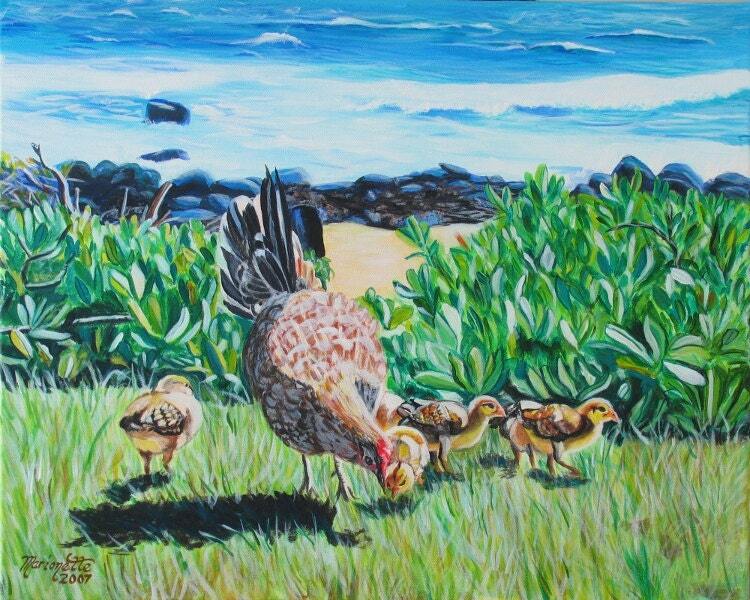 "At the Beach with my Chicks" This giclee print is signed by the artist and is printed with archival inks on radiant white watercolor paper. It is a reproduction of an original acrylic painting and comes packed in a clear sleeve with a backing board (unframed). Colors may vary slightly from monitor to monitor. I recently celebrated my 50th Anniversary in Hawaii. It was my first time there. It was a truly wonderful and memorable experience. The one thing I got a kick out of was the roosters and hens that were every where you went. We would be docked and all you heard were the roosters. I saw these adorable prints of roosters and hens and decided that I would get them. They are adorable. Every time I look at them, it will remind me of my time in Hawaii and all the wonderful memories I have. Thank you! Print is sweet and beautiful with bright colors. Received very securely packaged. Very nice seller. Would not hesitate to purchase from again. So pretty, must see in person. One of our favorite things about the island, free range chickens! Love the art! Great gift for a special chicken lover. Thank you Marionette!